Designed for Embroidery, Quilting, and Decorative Stitching Shine bright with Glitter! 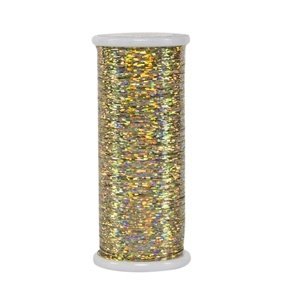 Glitter is a flat, hologram mylar thread which has incredible shine. Available in 24 colors. Glitter is made from a 4-ply film (twice as strong as other mylar threads). Use a Superior’s Topstitch #90/14 needle and a reduce the top tension to 1.0 and Glitter is guaranteed to work.